The credits on Superman 214 are not correct and some very talented people helped out on the inks and never got their just dues. It was Joe Weems, Danny Miki, and Trevor Scott who helped out Scott Williams. issue 213....pages 7, 18, 20, 21, and 22. So the original plan was to fly to LA for the premiere but given how late I am on Superman, that plan was tossed...luckily there was another one right here in the Big Apple last night and while Bruce Willis, Mickey Rourke, Jessica Alba and Rosario Dawson were not milling about like in LA, the NYC premiere had an all-star guest list that would have filled many a volume of Who's Who in American Comics. Seen hobnobbing at the Regal theater on Broadway and 13th last night were none other than Jeff Smith (who introduced Frank before the film began stating like many of us, that he would not have been in comics today if it were not for Frank), living legends Neal Adams and his son, Joel, Jerry Robinson (creator of the Joker and Robin), and Joe Kubert (and his two sons, Adam (munching away on some hot popcorn) and Andy). Got to chat up these guys for a while as the premiere was delayed for a bit til everyone got there. Also got to catch up with Walt Simonson who came by after the class he teaches at the School of Visual Arts (I think) was over and Gareb Shamus, owner of Wizard magazine. Marvel men in charge Joe Quesada, Alex Alonso, Jenny Lee and CB Cebulski were in the house. Representing DC were Paul Levitz, Bob Wayne, Dan Didio, Eddie Berganza, Will Dennis, Michael Wright, Anton Kawasaki and a host of other DC employees. Batman and Robin editor Bob Schreck was seen holding court, having jetted back from the LA premiere as well and the Beat's Heidi MacDonald was her usual social butterfly self. 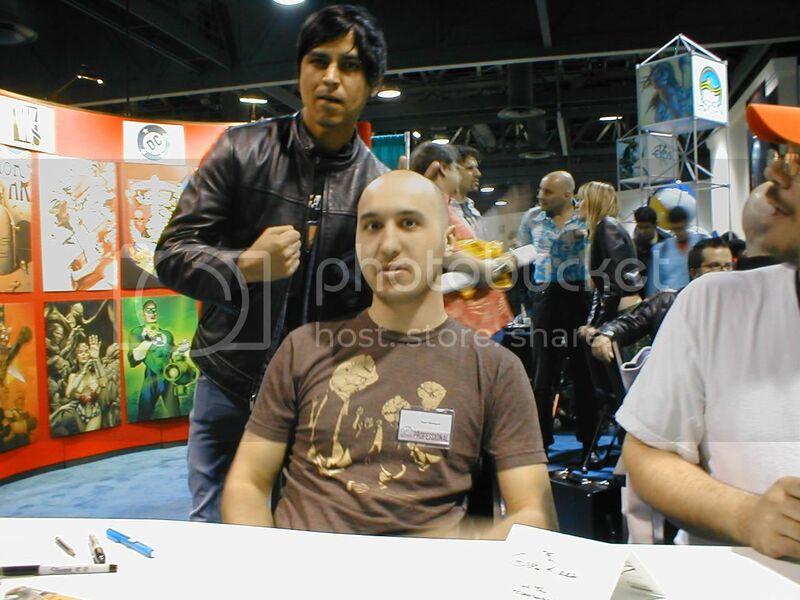 Also spotted was a certain tequila chugging Superman scribe--Brian Azzarello, artists Jae Lee, Lee Bermejo, JG Jones and Cammo of the Intimates. I meant to ask Garth Ennis what he thought of the Irish accents of some of the actors in the flick but lost him in the swarm of artists, publishers and retailers like Mimi and Alan from Night Flight comics in Salt Lake City. Eyespyed other talents like Paul Pope, Bill Sienkiewicz, Amanda Conner, Cliff Chiang, Trish Mulvihill, and Jimmy Palmiotti. Even got to chat up the lovely and talented Lynn Varley who along with Frank were the incredible hosts of the evening, both at the theater and later at the after party. I know I missed a ton of other peeps but that was what I saw. Few creators could amass such a diverse and incredible group of talent, executives, and retailers...thank God for Frank Miller. Oh and the movie ROCKED. A visual feast filled with bone crunching chiaroscuro action. I think Mickey Rourke pulled off one of the best roles of his career and Jessica Alba is smoldering wicked hot. What else can I say but if yer a fan of comics, hell, of good movies, check it out when it opens this weekend. Afterwards, go check out the comic he did and be amazed at how Robert Rodriguez and Frank Miller brought the art to life! It's getting to that part of the year for those who are contemplating traveling to Europe or more specifically, Italy to start making plans. Here are my bits of advice and other life lessons learned the hard way on the road. 1--Bring mosquito repellent. Many countries don't spray to the same extent and with the same fervor as in the US (which is for the better environmentally to be honest) and a lot of hostels lack AC so be prepared to fend em off during the night. 2--No need for travelers checks. The days of searching for the local Amex office and waiting in line with your passport to cash the day's budgeted spending money are over! ATMs are abundant and the rates/fees aren't horrible. The max is usually 250 euros, which is close to 300 US. I found you can often reinsert the card and get another 250 for the big payments (which in my case were apartment bills). 3--Eat local. Shun eating at the local McDonalds. You didn't spend hundreds of dollars on airfare and travel thousands of miles to eat food found right down the street at your local strip mall. Go out and get some cheap eats from local pizzerias, bars (coffee shops) and pastry shops. You can learn a lot about a culture by what they eat and why. 4-- Not sure if this is the rule in other parts of Europe but if you guys are looking to hook up with the local ladies, don't wear white socks with your shoes. Apparently that is a major fashion faux pas. How do I know this? Well, on my last day in Italy after a year living in Reggio Emilia, my friend and fellow artist, Cammo, told me in a bar in Bologna! Thanks for news... Madonna! Makes me wonder what other brutta figuras I made. Now someone is going to tell me leaving gloves on the table is bad too eh eh eh. 5--If you are planning a trip to Italy, don't go in August. A huge number of Italians take August off as a holiday (yeah the whole month!) so a lot of restaurants and stores and museums, especially in smaller cities will be closed. It's also very hot and muggy so go in June or better yet, September when the weather is near perfect. 6--Again in Italy, on a short trip, I recommend Rome (min. 3-4 days) and Venice (min 1-2 days) for the big cities and Siena and Lucca as smaller cities to visit. To find cities with less tourists, head south or east to Le Marche region or Puglia further south. 7--A lot of cell phones work overseas now if you sign up for service through your carrier for that region. I think you need a tri-band or GSM/GPRS enabled phone. If you get your phone completely unlocked, you can buy a SIM card overseas and pop it into your phone and make local calls for 5 or 7 cents a minute. In some countries tho like Germany, you will need a local address to buy one. If you use your American carrier, look to pay a buck and a quarter a minute to call. For short trips, just skip all this and use your US based carrier and your phone for emergencies. 8--Pack and then repack but leave out 50% of what you initially packed. Your arms and back will thank you later. 9--If you love soft toilet paper, bring your own roll or two. And pack some Metamucil in capsule form--you'll thank me later. Was gonna post this earlier however I kept forgettin' to get a copy. But last week when Mark and Carlos did their little challenge I too pooped outta doodle. Thought I'd post it for tinks and tittles. I didn't take the full hour as I was busy going back and forth shouting the time. But the subject matter grabbed my attention and i wanted to give it a go round. ...anyway, I'm taking a little break from the drawing desk, so why not post something on the 'Metti, right? And since Jim just posted some Wildcats stuff, here's some W.C. o' my own. This is the 'grey guide' I did for a Wildcats pinup in the COUP d'ETAT sourcebook. Whenever time allows, I like to do these 'guides' to help out the colorists, but also so that the 'modeling' and lighting on the figures is a little closer to what I was imagining. Here is an elaborate con sketch done at last year's Angouleme comics festival. A French fan--Xavier, probably Gabrielle Dell'Otto (Secret War, Batman:Europa) biggest fan and supporter got Gabe and I to each pencil on the same piece of paper. 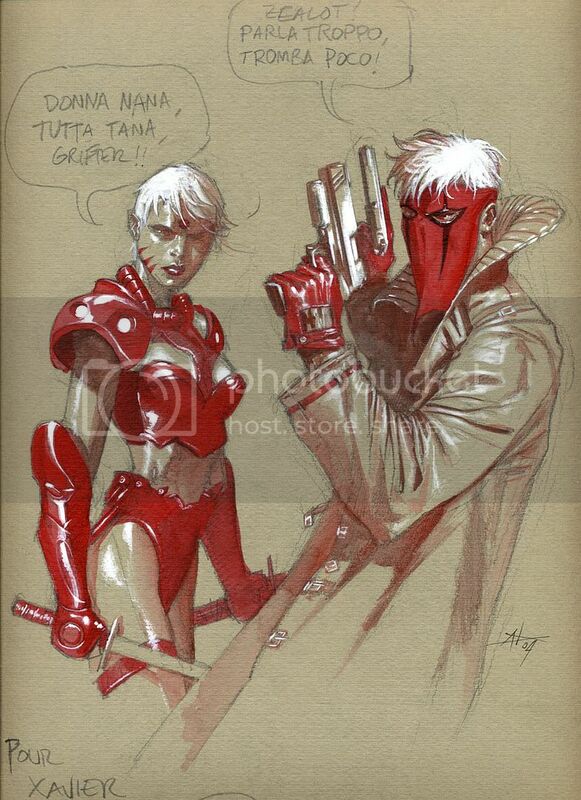 I sketched out Zealot on the left, and Gd8 did Grifter. Gabe then painted both figures to create a stunning, unique image which hopefully will be the first of many other images we create together...once he gets his business squared away on Secret War. And he did it fast...that kid is talented. Here is a bigger shot here. Been busy lately. That's why the posts have been sparse. Been trying to get my work done, and come through with more comic strips, and help my wife out in her final week of pregnancy. So basically my time has been eaten up like a box of pastries layed out in front of Carlos, lol. I'm really into this current issue of Batgirl, it features some swanky ladies! Problem is though I haven't had much practice with faces and expressions lately, so it's really kickin my a$$! Wanted to post one of mine and Carlos's old Gen covers. Man I dig Hewlett sooo much! The new Gorillaz single Dirt Harry is hot also! I strongly suggest purchasing it from itunes if you get the chance! There's no better way to drop 99 cents! I was just telling Rich and Carlos yesterday how cool that concept is. It'd be a dream come true to do something like that. Bring all your fav musicians together and then create some frikkin awesome animated looks for them, sweeet! Someday, who knows? But back to Hewlett, the guy's a genius in my book. He provides so much inspiration it's ridiculous. Those Gen covers, Carlos and I did were such a blast, I can only hope to revisit that look somewhere down the road. Other than that, congrats again to the winner of my Batgirl drawing. It was a pleasure! And yeah, beanies are cool! "we hate it when our friends become successful" PSHOO!PSHOO! 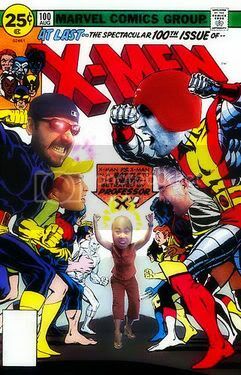 Here is a very old image I did back when I worked at Marvel. Marie Javins was an editor at the Big M at the time and had a bovine themed collection of sketches including some incredible ones by all sorts of names in the industry. I, of course, had to add to her collection and came up with this bull. It was done with marker and whiteout...a lot of whiteout. I would put down blacks with ink, go back over it with white then add black again and then with white, creating a very 3-D and textured look. May have been because it was in fact, 3-D. You could run your fingers over the image and feel and the ink and whiteout caked on all over the piece. I liked the etched look it gave me and the illusion of light streaming through the tree branches. Go to her website and click on the names on the left to see all sorts of other cow-themed sketches. It's worth the trip. Another image I been meaning to post up. It's our own 'GTAzn' who was the winner of the Ale Garza Batgirl sketch from the last WS trivia challenge. Here he is, decked out in Garza Gear (tm) mirroring the same pose Ale G posted some time back. Who says the internet is a waste of time?...ok, ok, my editor does. Been meaning to post up a larger shot of this sketch I did at a show in Naples, Italy, a year ago. Sometimes at shows I will experiment with different techniques and approaches. Sometimes I will do all the sketches just in pencil, other times, I will whip out the sable brush and ink and do washes. This time, it was a traditional marker and whiteout sketch but with some pencil rendering and patterns thrown in. I chose that approach as I didn't want her tattoo to overwhelm the shot. Having something that complex and large on her figure would really jump out in straight black and white and I wanted a more subtle look. Carlos was gracious enough to allow me to post under his name. I’m pretty busy working, but I figured I’d post a sketchbook page that was a lot of fun. Three different, equally, confusing directions all on one page. Hehe…I love those Struzan mouths. …yeah Dude, you better be gracious!!! Heheh, I just realized that that dude eating ‘cereal’ is Goya’s “Saturn” eating his kids. Scott’s one crazy Kid I tell ya’! ...and now, the inked stuff. For me, finally making the decision to commit to doing a monthly book has been AWESOME!!! It’s definitely hard, especially penciling and inking it. You have to make A LOT of compromises as far as the art goes. You just can't spend that much time analyzing every little aspect of it, or redrawing things left and right. Most of the time, your 'first' try, becomes your last, simply because the 'time-crunch' makes corrections or redraws into a "luxury" ...BUT, at the same time, the "do or die" rhythm of doing a monthly is a GREAT learning experience. It forces you to think on your toes, and also lets you REALLY see what your 'weak spots' as an artist might be, and also pushes you to find a fast and effective way to fix those weaknesses. A great source of inspiration are artists like Eduardo Rizzo or Marcelo Frusin (or Todd McFarlane in his day) even Jim (Lee). All these guys have penciled and inked AMAZING looking books on a monthly schedule, so that right there let's you know that 'IT CAN BE DONE', and it can be done VERY WELL, without 'hacking' the stuff out. For a couple of years now, I've been inking my own stuff, and the biggest challenge has always been "How the hell can I do 'two' jobs (penciling and inking), and still meet my deadlines?" and really, the solution is pretty much the same for most artist out there who ink their own pencils, and that is; Don't 'finish' the pencils!!! This doesn't mean that you 'half-a$$' the pencils, it just means that you don't 'finesse' them as much. You only give yourself as much information as you need to make sure the drawing is solid (anatomy, perspective, proportions, etc etc.) and sometimes, 'basic' lighting direction. This also helps in keeping the drawing 'fresh' for me, because I am making all the 'detail' decisions in the inking-phase, and changing and redrawing things at that stage, that way, it doesn't feel like I'm drawing the same thing twice. ...so here's an example of what I mean. Was going to foodblog a bit more but I can hear those channel clickers clicking already so here's some art for a change. 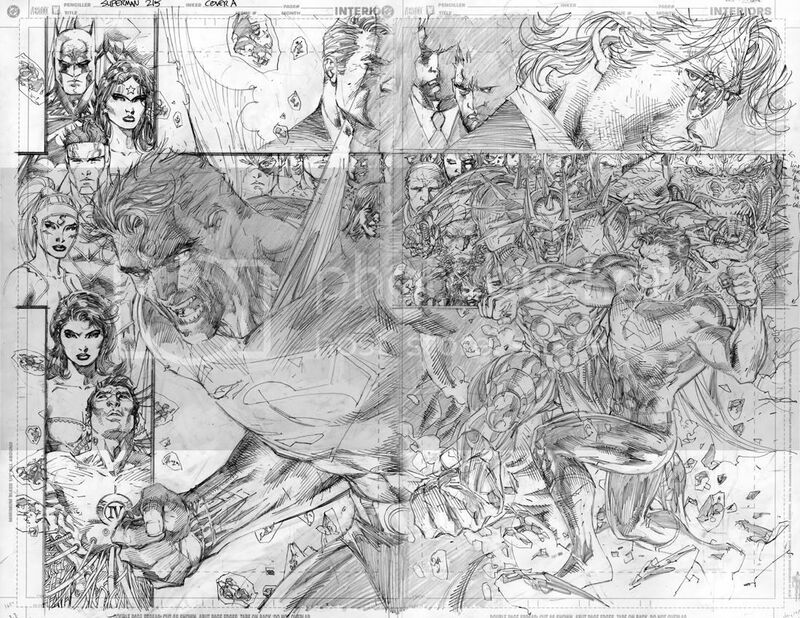 You've seen the colored covers, but here for the foist time are the pencils to the two covers to Superman 215. Sharp eyes may spot the changes that were done after this piece was scanned in. Scott Williams, upon getting the original pointed out some wonkiness so I spent another 2 hours tweaking little minor things. At that point, I was so tired of looking at it, I couldn't stomach even scanning it again. The interiors look solid and I think are a fitting end to Brian's saga. [ale] A while back my wife took me on some cattle casting call for a teen cheerleading movie. I was there just for support but it turned out they were going to need a lot of bodies for this flick. And me just so having a body fit the part perfectly, heh. The funny thing is is the movie turned out being quite a little smash hit known as Bring it On. At the time they had wanted us for the whole 31 days of shooting. However after just one day my wife and I decided that being an extra was just not for us. We sat around all day in the blistering sun of SDSU's campus waiting to be called in to shoot about what was 3 scenes about a hundred times each, bleh. the silly thing was though, that even though we only did one day, we somehow managed to get on screen. You can almost quite clearly see us walk through two scenes. Of course those were back in my spikey haired days, heh. We pretty much never attempted to do anything like that again after that. Although, in retrospect it was a very interesting experience. Mainly just seeing how movies are shot, and how pampered some actresses are. lol! -a "oh you silly rabbit" PSHOO!PSHOO! ...and somebody had asked me to 'suggest' cool places to go to in Italy, and really, Jim or Lee Bermejo would be the better people to ask, BUT, from what I got to see, Rome's a must, so is Venice, and Florence (anything in Tuscany I imagine), and in the North, there was this beautiful town called Mantova (hope I'm spelling that one right) another one called Urbino…Parma is very pretty as well (apologies to Micciu!! ), and while you're there, go bug Lee and Cammo in Reggio Emilia (^_^)...then go to this place called "Torinese" and get some pastries!!! As promised, some commissions...I like to try different things at each show. So for this show I went with grey tones. I used some warm greys to get these done, along with brush pen. Like always, 11" x 17" bristol. This one featured our li'l miss Cassie (link here), aka Batgirl. The buyer requested a very specific pose. Tried my best to give him what he wanted. Hopefully I'll get some of the other scans, did a pretty cute Supergirl, and had a ton of fun on an Ivy (Soul Caliber) request.
" What is all this?..." PSHOO!PSHOO! A bit of non-comic book blogging tonight. Should have really posted this prior to the Wizard World Long Beach show but I had to get ready for my trip to NYC where I am now. It's cold here, but we had some Korean food last night at Kang Suh on 32nd and Broadway which in my opinion is the best Korean BBQ restaurant here in da Big Apple. Now for those of you who have not had the chance to eat Korean, it's not BBQ like as in KC BBQ ribs or burgers or anything remotely like that. Korean BBQ involves a grilling thinly sliced marinated rib-eye steak. The marinade consists of soy sauce, garlic, some sugar and pepper. I'm sure I'm missing some other secret ingredients but eating Bul-Go-Gi with some Kim-Chi chigae (Kim Chee soup) is just the best thing in the world, especially when it's chilly outside. For the hotter summer days, indulge in some Naeng Myun (a simple buckwheat noodle soup served ice cold in a vinegar, mustard beef broth soup with sliced cucumbers, sliced Asian pear, a sliced hardboiled egg and slices of cooked beef. Now I say Kang Suh was the best in NYC and frankly, it's not as good as it once used to be once the city laws were changed to prevent the restaurant from using real coal embers to grill off of. Now they use standard propane gas jets which most Korean restaurants have. But if you want the best, find a Korean joint that cooks over real, the one-Ring red hot coals...like the place in the picture above in LA. Soot Bull Jeep is not a car dealership but a real hole in the wall, authentic Korean BBQ place in K-town, LA. It's a block off 8th and Vermont owntown on 3136 West 8th Street. Despite it's run down décor, this place is awesome but it comes at a price. A plate of Bul-Go-Gi will run you about 19 bucks and feeds about 1 1/2. But order 2 plates cause if you order just one, they won't let you grill at the table but rather they do it for you on a frying pan in the kitchen which is a major NO-NO. The beef gets all soft and runny that way and frankly, tastes horrible here and everywhere if you order it that way. Do yourself a favor and always order the usual minimum of 2 beef dishes and get ready to have some great grilled beef and take the leftovers home for later. After you grill the meat, take some cool, fresh lettuce, drop a little ball of sticky Korean rice into it, some Bul-Go-Gi (or Kal-Bi which are marinated rib meat) and some pungent, slightly spicy bean paste on top, wrap up the lettuce over the top and stuff it in your mouth. Go all out farmer style and take some Kim-Chee (spicy pickled cabbage) and throw that on the grill too. Or order the soup if you have a cold and want to blow yer sinuses open. Made properly, Kim-Chee soup is a nice opaque red, super spicy concoction that can also clean grease off your engine. Haven't been around for a few days. The reason being is I was up in tha LBC attending the Wizard convention. Man, whatta weekend! From the barroom antics of a fellow comic pro, to the hotel room shenanigans, it was truly a weekend to savor, lol. I attended last year and had a blast, and this year's show was no different. I was shacked up with fellow artist Mark Brooks for the entirety of the show. We had what could only be described as "Alé and Mark's big 'fruity' weekend," heh. Also got to kick it with fellow pros Karl Kerschl, and Dave McCaig. Both of whom are extremely talented and super cool...yo! Once again the DC booth provided great shelter, and even though Marvel had an actual booth, DC was still the place to be! The night before the show, Mark and I got a little boozy, and a little singy, and did up the above piece. The idea was to raffle it off during the show. A lucky young lady known as Maria was the big winner having only had to shell out 10 bucks for her tickets...(napolean says) luckyyyy....Congrats to her though, the piece actually came out pretty nice considering I could barely hold my head up while drawing my Wolverine, heh. I'll post some of the commisssions I did as I get the scans sent to me. All in all a great time, and I can't wait for Comic-Con! Pics of me annoying both Karl Kerschl, and Greg Rucka, the new creative team on Superman Adventures, make sure to check for it...yo! ...aren't these things DAMN COOL?!? Hi y'alls, how's it going?!? So I guess I haven't mentioned this book much since it's been announced. I figure I guess I'll go into it a bit now, heh. Last year when I was in-between my stints with DC a project came up. Nick Barrucci had been trying to find me something to work on for ages. Actually since I first finished up EVE. I met up with him at last year's Wiz LA show, and he pitched me some projects. Since at the time I was not exclusive anywhere I thought it'd be a fun idea to give ol' Nicky a try. So I did. The project that seemed most appealing to me was this one, this Fathom one shot. I had been friendly with Mike (Turner) for quite some time and really wanted to work with him. The pitch was, let's show Fathom when she was a teen, just before she started to realize who she really was. It was to be handled almost like a teen soap. Nothing gratuitous, no cheesecake, just a sweet story about an important time in this girl's life. I gotta say, JT Krull really delivered one great character-driven story, so I was hooked. I really think it's a cool story even if you've never read a Fathom book. Plus I got to draw a T&C shirt, lol! I did it awhile back so it's interesting to see it finally coming out. Check for it in May, i think you guys may enjoy it! "Hey Wizard, what's with the pshew, pshew? It's..." PSHOO!PSHOO! So ends the first volume of Gelatometti. It's been running slower and slower for us, both in posting and in commenting and I suspect it is a function of all the heavy images we have loaded on the site. So to alleviate congestion--I have started Sun of Gelatometti found here at this link: www.gelatometti2.blogspot.com. I will redirect www.jimlee.net to that new site and leave this post as the last of the old site for those who learn of the migration in the days to come. Hopefully it will run much smoother and for those of you who have registered--well, there's no need to redo it as it is just another free blogger site. Bookmark it now! This site will remain standing of course as a source of information and of course, will be fair game for the infamous monthly Gelatometti challenges where we give away wonderful prizes. Cya on the other side. Both entries are done! The theme today... Hellboy's little sister! Both entries look fantastic! Have fun voting! A relative grewbie to the scene Mark Brooks made a splash on the comics scene with beautiful artwork on Marvel Age Spider Man, and Amazing Fantasy. 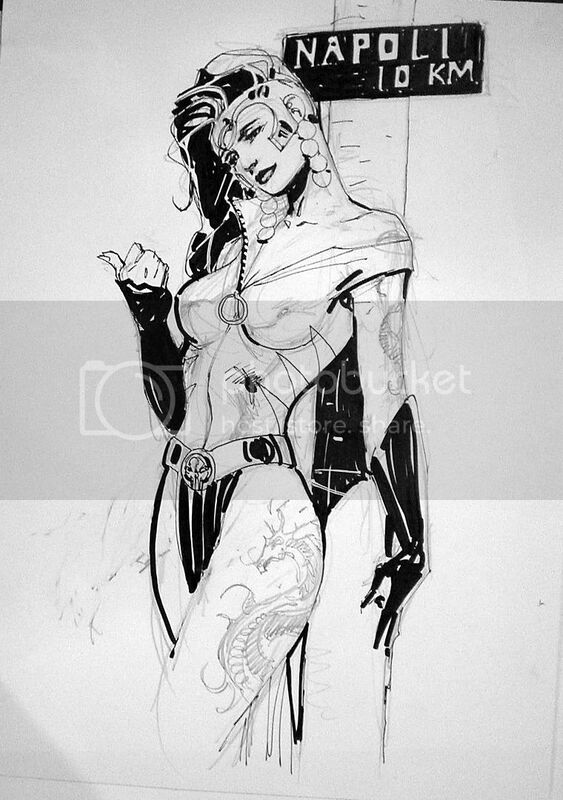 Most recently you can find Mark's work on the covers of Araña, and an upcoming X-Men project! Adept at drawing both buff dudes, and sexxy lady's our Iron Gelatomettista Carlos D'anda will surely have a handful with today's challenger! As a change a pace today's battle will be decided by our own Chairman Sandra Hope! Today's battle will begin at approximately 4:15 pst, and end at 5:15. Challange!!! Iron Chef Gelatomettista Battle 4~! So finally here is the next installment! Today we have from Atlanta, GA Mark Brooks battling our own Carlos D'anda. In what promises to be the most heated contest yet, today's contest will begin at 4:00 pst. Like always you the fans will decide the contents!